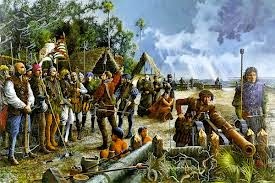 On August 28, 1565, Don Pedro Menendez de Aviles of Spain, newly designated as the Governor of Florida, first sighted the land that he had been assigned to explore and rule. Populated by the Timucuan Indians, whose village of Seloy stood nearby, the area was threatened by the encroaching French, whose fleet patrolled the coastal waters. Don Pedro landed eleven days later with 600 men, and fortified his position with a crude wooden fort. He named his new settlement San Agustin after the saint upon whose day he had sighted the land. 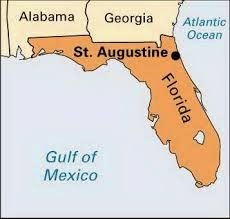 St Augustine is the oldest European settlement in the United States, founded forty-two years before the English colony at Jamestown, Virginia, and fifty-five years before the Pilgrims landed on Plymouth Rock in Massachusetts. Don Pedro’s first order of business was to destroy the nearby French garrison, which he did using his excellent military skills, and to drive off the French ships, which he also accomplished (this time with the aid of a hurricane.) 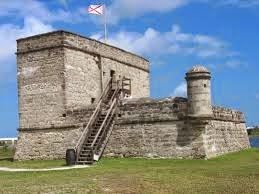 Now, from its strategic position in northeastern Florida, the Fort of St Augustine could protect the route of the Spanish Treasure Fleets taking gold and silver back to Spain, and also provide protection from the French and English, who, having gained a toe-hold in North America, were beginning to drift south, toward the richer pickings in the Spanish Empire. Originally the settlement of St. Augustine had been intended as a landing point for more settlers, and a base to further explore and colonize the region. But relations with the natives were never good – natives attacked and burned the fort in 1566, and continued to mount irregular raids after it was moved and rebuilt. In addition, deserters from the French forces turned pirate and made efforts to rob the settlers. The French government also tried to re-take the region. The English began raiding when Sir Francis Drake, the Elizabethan pirate and privateer, attacked in 1585. He burned the fort again, driving the Spanish into the forest, but did not have enough men to hold the ground. When the English captured Jamaica in 1655, the island was used as a base for English buccaneers and privateers to attack the coast. Then, in 1668 English privateer (and part time pirate) Robert Searle attacked St. Augustine. His aim was to loot the silver ingots held in the town’s royal coffers. Under the cover of night, Searle and his men slipped into the harbor and attacked the sleeping town, killing 60 people and pillaging government buildings, churches and homes. 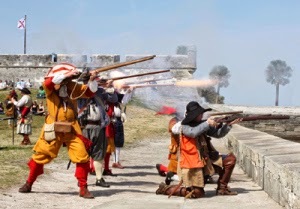 Because of the devastation wrought by these bloodthirsty pirates, Spain’s Council of the Indies finally issued money to build a massive stone fortress on Matanzas Bay to protect the city. Spain was still thinking in terms of “castles” when they built stone forts. The so called “Castillo de San Marco” is made of a stone called coquina, (coe-keen-a.) Spanish for "small shells." The stone is composed of ancient shells that have bonded together to form a type of very soft stone similar to limestone. Workers were brought in from Havana, Cuba, to construct the fort. The coquina was quarried from the King's Quarry, in what is today Anastasia State Park across Matanzas Bay from the Castle, and ferried across to the construction site. Construction began on October 2, 1672 and lasted twenty-three years, being completed in 1695. One wonders what the workers thought of this native stone. Not much stronger than the shells it was composed of, the coquina stone seemed much too weak to withstand cannon fire. 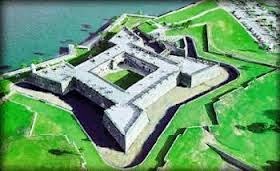 Yet the Castillo de San Marco is the only fort in the United States that has never been captured! How could this be? When bombarded by cannon fire, the soft stone walls absorbed the cannon balls, as if made of soft mud. Even today, the iron balls can be seen, embedded in the undamaged stone. 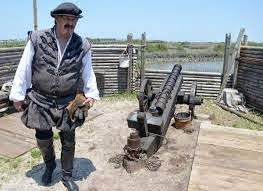 St. Augustine, with its strong fort, continued to grow, but remained a military outpost, rather than a plantation town. It was ceded to the English at the end of the Seven Years War in 1763, and was re-ceded to Spain at the end of the American Revolutionary War. It finally became part of the United States in 1819. Today, St. Augustine is primarily a tourist town, cashing in on its rich history. Home of the oldest house in America, birthplace of the first European child recorded in the New World, the earliest free African settlement, and with an undefeated fort, the city has much to offer. It is also a haven for pirate lovers. I have fond memories of visits to St. Augustine when I was a teen and again when I was in my 20's. Its a very historical place with a lot of interesting things. I would love to visit there again.